When summer arrives in Seattle, Seattleites do everything they can outside. Finding outdoor seating for Happy Hour is a must for many of us. 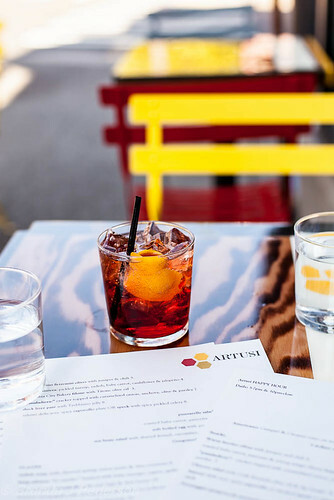 Artusi, located right next to it’s older sibling Spinasse, on Capitol Hill fills the bill with a double row of two-person tables outfitted with brightly colored chairs inviting you to make yourself comfortable and settle in for a while. The one caveat is it’s a little noisy since the tables are close to the street and a stop sign is at that corner. The Happy Hour menu offers a handful of small bites, specials on Campari cocktails, beer and wine. While the menu offerings aren’t extensive there is a nice selection of savory bites which periodically change to keep it interesting. If you don’t see something on the Happy Hour menu that catches your interest you can always order from the main menu. Since I’ve been on a Campari jag lately, the Americano was exactly what I was looking for. Paula ordered the Happy Hour white wine which was a nice, Falanghina, one of those Italian white wines you may not be familiar with but will love once you try it. We started with a couple of the bruschetta featuring pancetta and roasted baby carrots finished with soft and slightly melted young Asiago. The sweet, intense flavor of the roasted carrots knocked my socks off! We also ordered a pissaladiera, a cracker-based version of the French classic. 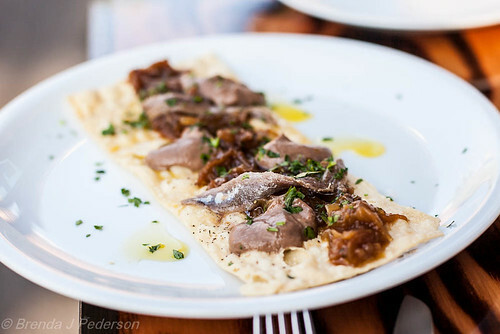 Caramelized onion, anchovy and a sort of olive puree topped a delicate cracker. It was a great combination of salty and sweet with a little bit of crunch. For our finale we opted for cheese. We chose the Gorgonzola with honey as the perfect way to round out the meal. My only complaint was nothing came with the cheese. While the piece of cheese was generous, not a slice of bread or cracker accompanied it, so we also ordered the Columbia City Bakery filone with Ligurian olive oil. Call me crazy, but I think cheese needs a little something with it. In the scheme of things it’s a slight nit, but one of those things that makes you wonder. 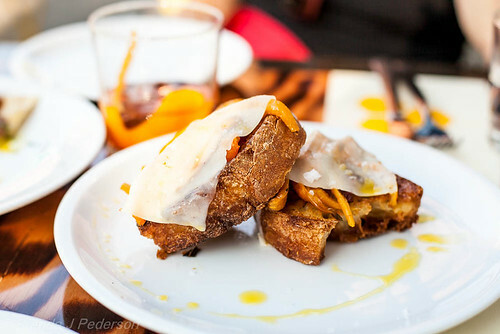 All in all, I’m looking forward to another sidewalk Happy Hour at Artusi. Don’t miss the sage pasta next time! It is wonderful and made in-house.